The main task of ELSA is to provide a continuous electron beam in the GeV energy range. This distinguishes it from most other electron machines which deliver a pulsed beam. 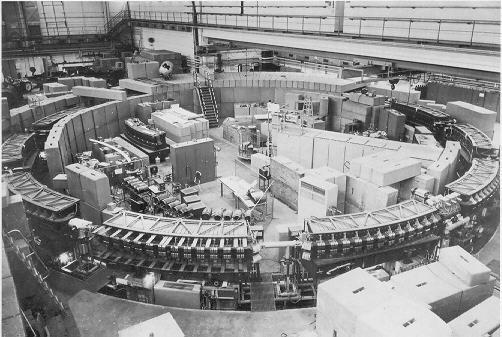 Since 1967 a pulsed 2.5 GeV synchrotron exists at the Physics Institute of Bonn University, which runs with a repitition rate of 50 Hz. 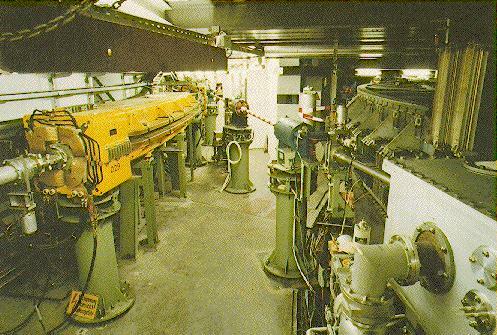 It is now being used as injector for the stretcher ring ELSA, where the pulsed beam is converted into a continuous beam. The stretcher ring is basically a storage ring, where the beam of the injector can be stored until the next pulse is ready. In that time it is continuously extracted to the experiments, so that these experiments receive a continuous beam. Since the old synchrotron could be reused as injector, this stretcher ring concept has been significantly cheaper to build than other continuous beam accelerators like the recirculating linear accelerator at JLAB. However, the external beam intensity is some orders of magnitude smaller. The stretcher ring concept is especially suited for tagged photon experiments which require low electron currents. Using this concept, ELSA has been the first operating high duty factor machine for energies up to 3.5 GeV. Following the tradition of our laboratory ELSA was foreseen to be a university machine, where students participate in the design and construction of the accelerator. This concept and the fact that no comparable experience existed for a stretcher ring of this size might explain the relatively long time that was needed before the first experiments in medium energy physics could start. On the other hand the low cost of the stretcher ring of 20 million DM including the buildings is a remarkable consequence of the participation of students. ELSA can be operated in three different modes. The old 2.5 GeV synchrotron serves as the injector for energies up to 1.6 GeV. Up to this energy the described pure stretcher mode can be applied. The magnetic field of all magnets in the stretcher ring is kept constant. Only four aircore quads are used to control the extraction rate by moving the betatron tune towards the 14/3 resonance. Above 1.6 GeV the stretcher ring is also working as post-accelerator. By ramping the magnets up to higher fields, the energy of the electrons can be increased up to 3.5 GeV. Because during ramping no beam is delivered to the experiments, to increase the duty factor several pulses of the injector are accumulated before ramping. For these two modes of operation various schemes of extraction have been applied. In the third mode the main ring is used for synchrotron radiation experiments by storing large internal currents for long times. Typical storage times are some hours at beam energies of 1.6 to 3.0 GeV.